LITHOGRAPHIAE WIRCEBURGENSIS, ducentis lapidum figuratorum, a potiori insectiformium, prodigiosis imaginibus exornatae specimen primum. My blog post of April 1st 2011 announced the frightful partial collapse, in the middle of the night, of the Quarry Visitor Center onto the dinosaur fossil exhibit. It was a successful April Fool’s joke because 1) this was about half way through an extensive 18 month demolition, rehabilitation, and reconstruction project on the building which I had been covering in detail in my posts and 2) nobody thought I would be enough of a jerk to joke about such a thing. Of course, those who actually read the entire one paragraph post through to the end came across the last sentence that revealed it was an April Fool’s joke. But some people panicked after the first few sentences and just began making phone calls. Most people’s antennae are up when April 1st rolls around and putting together a successful April Fool’s joke is really quite difficult to do. There are many other paleontology bloggers who do such posts quite well. Rather than fail badly at that, today I’ll blog about a bit of fossil fakery from the early 18th century. This is not fakery meant as a joke but intended to damage reputations and motivated by academic and professional envy and desire for revenge. Dr. Johann Bartholomew Adam Beringer (1667-1740) was a successful physician, earning the titles of Doctor of Philosophy and Medicine, Senior Professor and Dean of the Faculty of Science of the University of Wurzburg (Germany), Advisor and Chief Physician to the Price-Bishop of Wurzburg, and Chief Physician to the Julian Hospital. Unfortunately it seems that relatively little is known about his life. In addition to his high standing in society Beringer was also an enthusiastic dilettante in fields other than medicine. It was his fascination with oryctis (“things dug from the earth”) that led to the scandal for which he is best known to modern scientists and historians. 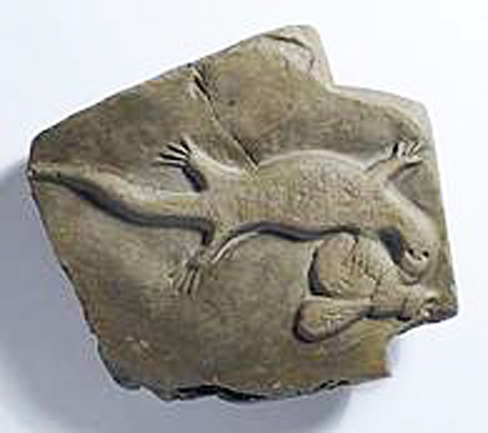 Lizard eating a fly: one of Beringer's original "Figured Stones". The early 18th century was a time of upheaval in the science of paleontology. Long held classical theories about the nature and meaning of fossils were being scrutinized and many new ideas about fossils, some more realistic than others, were coming to the fore and being discussed and debated. 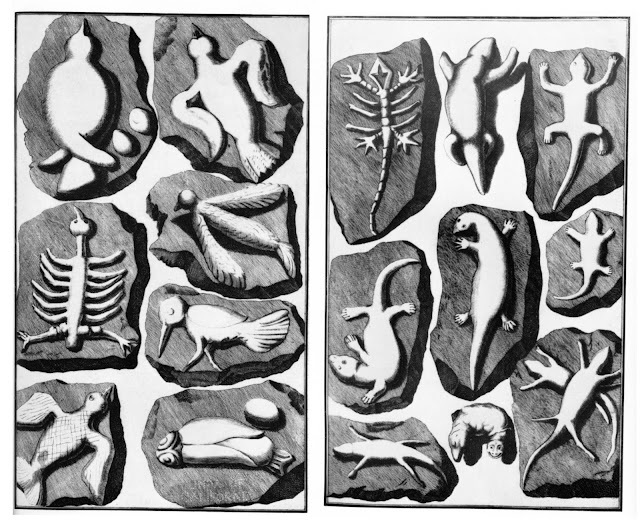 Beringer was interested in fossils and had his own thoughts on these matters, although they would be viewed as bizarre by modern scientific standards. But he was passionate and started to compile a significant collection of fossils from all over Europe. Although it is unclear when, Beringer hired several young men, aged 14-18, to work with him on Mount Eivelstadt and bring in any fossils they might find. Nothing of real significance was discovered until May 31, 1725 when the first three of a long string of “fossils” were brought to him. Beringer became very excited by these fossils and the others that followed and amassed a large collection. He felt he had made a spectacular discovery, one well worth scientific description and publication and one that would further enhance his reputation as a learned man. Occupying the Chair of Natural History at the University of Wurzburg placed Beringer in an academic setting. For reasons uncertain, he made enemies of some in the university. J. Ignatz Roderick was a university professor of geology, algebra, and analysis. George von Eckhart was privy counselor and librarian to the prince’s court and the university. Both despised Beringer, because as Roderick put it “… Beringer was so arrogant and despised them all.” They conspired to exploit Beringer’s passion for fossils in order to ruin him through fossil fakery. Figured stones bearing butterflies and moths: lithograph from the Lithographiae Wirceburgensis. The plot involved carving fake fossils and either selling them directly to Beringer or planting them on Mount Eivelstadt where they would be found later by Beringer and his hired crew. At least one of that crew, Christian Zanger, was brought into the plot and paid for his services. Roderick carved hundreds of fakes at least some of which still survive. The fakes included normal types of fossil organisms, leaves, flowers, beetles, wasps, moths, butterflies, spiders, fogs birds, snails, lizards, crabs, fish, etc. (not infrequently in copulito). Figured stones bearing spiders, some still in webs (! ): lithograph from the Lithographiae Wirceburgensis. Figured stones bearing birds (left) and lizards (right): lithograph from the Lithographiae Wirceburgensis. 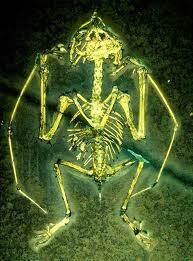 But many of the vertebrate fossils were not skeletons, but complete animals (such as birds with all their feathers). More outrageous still were other fossil carvings of the Sun, the Moon, and shooting stars (with their tails!). Amazing figured stones bearing moons, suns, stars, and comets: lithograph from the Lithographiae Wirceburgensis. Finally, there are numerous blocks bearing Hebrew letters. These look patently fake to us but not so to Beringer. He recognized that they might be carved but found evidence to dismiss that concern. Since "with God all things are possible" he was not even deterred by the shooting stars or Hebrew letters. If you believe anything you end up believing this. 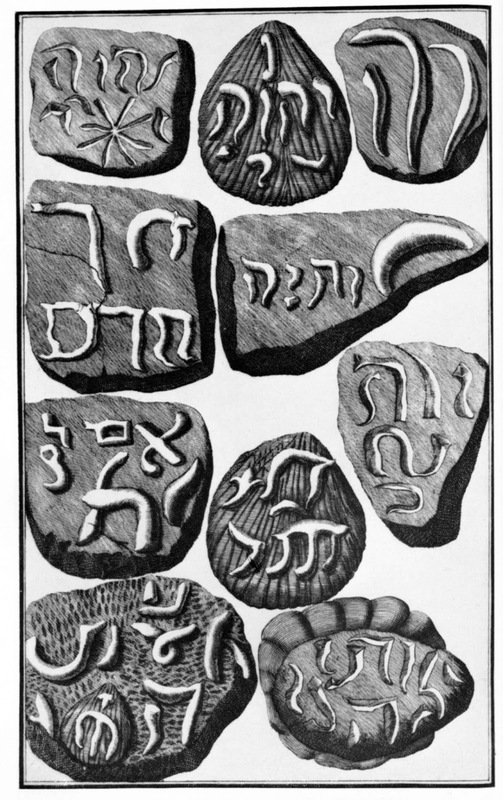 Figured stones bearing Hebrew letters and words: lithograph from the Lithographiae Wirceburgensis. His belief that they were not forgeries was due, in part, to the fact that he himself had excavated some of them on Mount Eivelstadt (without realizing that they had been planted). It was also due in part to Beringer’s ideas about the origin of fossils. He was committed to the idea that that God has put them into the earth, maybe for his own amusement, maybe to test the faith of believers, or maybe for reasons we can’t understand. Given those views, he was nonplussed by the occurrence of Hebrew letters and words. 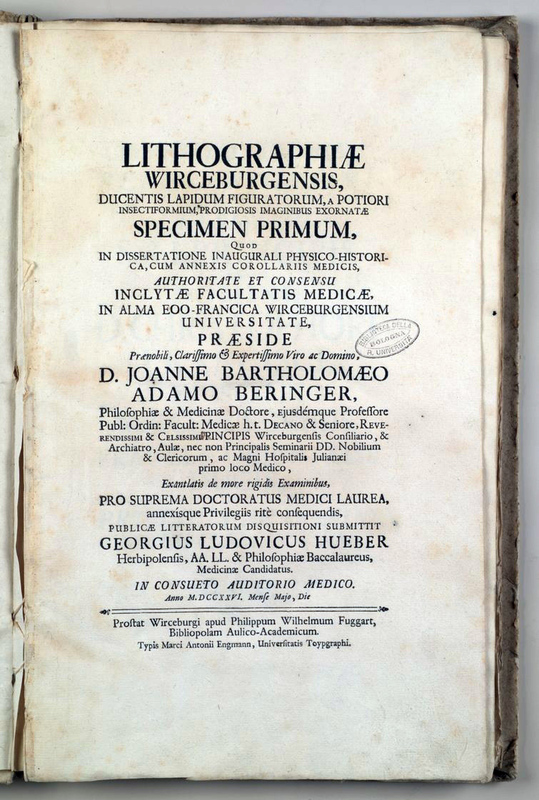 Image of actual title page of Lithographiae Wirceburgensis (1726). But Beringer’s fame didn’t last for long --- trouble started soon after. How Beringer came to realize that all his precious fossils from Mount Eivelstadt were fakes is uncertain, but it occurred soon after the Lithographiae Wirceburgensis was published. 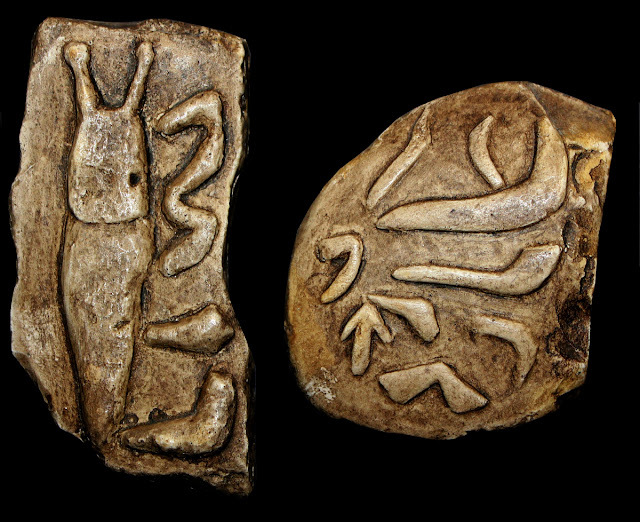 One account is that it happened when he excavated a slab with his name carved in Hebrew letters, but there is no historical evidence to corroborate that. At some point before publication of the book, both Roderick and Eckhart became quite alarmed about what they had done. They feared that they might suffer dire consequences should Beringer’s work appear in print. Roderick and Eckhart made repeated attempts to alert Beringer, even going so far as to sell him some fake fossils and then telling him that they had carved them. But Beringer was so convinced of the correctness of his own ideas that he simply dismissed them. Regardless, by April 13, 1726 judicial proceedings were underway against Roderick and Eckhart, proceedings instigated by Beringer to save his honor. Transcripts of parts of the trial still exist (see Appendix B in Jahn and Wolfe 1963). Not only was Beringer’s honor at stake but so was that of the powerful Lord Christopher Franz, to whom the work was dedicated. The trial discredited Beringer. Some stories of the event have Beringer spending all his fortune trying to buy back all the copies of his own book and dying shortly after the trial. However, we know that account to be false, because Beringer died some 14 years later in 1740. He had remained in his academic position at Wurzburg, publishing at least two additional books. Eckhart lost his post and his library privileges, which was disastrous for him because he was a well-known, and accomplished historian. Upon Eckhardt’s death four years after the trial a number of his unpublished and unfinished manuscripts were found in his estate. 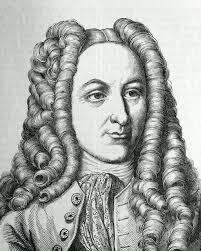 Roderick soon left Wurzburg, although whether as a result of being expelled or of his own volition is unclear. He evetually appealed to Bishop Christopher Franz and was allowed to return to Wurzburg in 1730 to help take care of parts of Eckhart’s estate. He was eventually permitted to again teach geography and algebra. WHAT ABOUT THE FIGURED STONES? The Lithographiae Wirceburgensis contains lithographic plates showing some 200 figured stones and an unknown number of others were collected before their real nature became known to Beringer. I have not found an account of what happened to the collection but originals are on exhibit at the Oxford University Museum in England and the Teylers Museum in the Netherlands. Several years ago, while studying dinosaur specimens in the Oxford Musuem, I purchased replicas of two of the stones in the Museum gift shop. Photos of those replicas are below. Casts of two Beringer's Figured Stones. Right a fake slug. Left, carved marks including the number 7, an arrow, and a clay pipe among others. 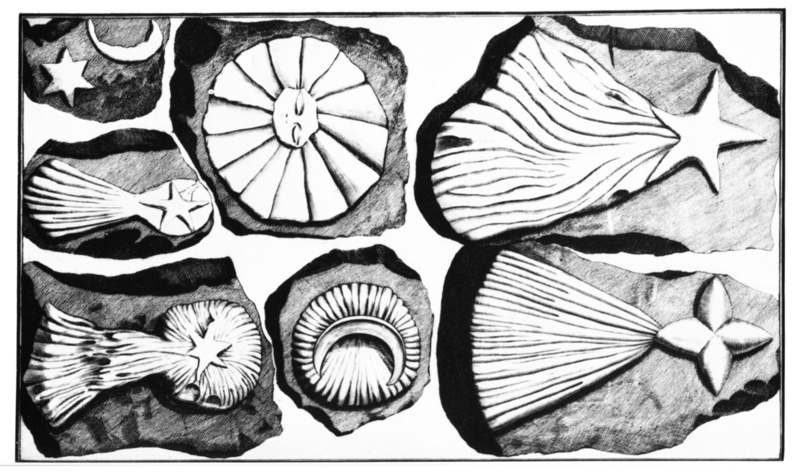 It’s hard to understand how Beringer, who already had a sizeable collection of real fossils from around Europe, could have failed to recognize these as fakes, especially after the fakers admitted to carving them. But self-deception and over confidence in one’s beliefs is part of the core of the Lithographiae Wirceburgensis story. That’s something to keep in mind even when not studying fossils. Jahn, M.E. and Wolfe, D.J. 1963. The Lying Stones of Dr. Johann Batholomew Adam Beringer being his Lithographiae Wirceburgensis. University of California Press, Berkeley and Los Angeles: 221 pages. Translation of: Beringer, Johann; Hueber, George Ludwig (1726). Lithographiæ Wirceburgensis. Würzburg. All lithographs from the Lithographiae Wirceburgensis: Jahn and Wolfe 1963. 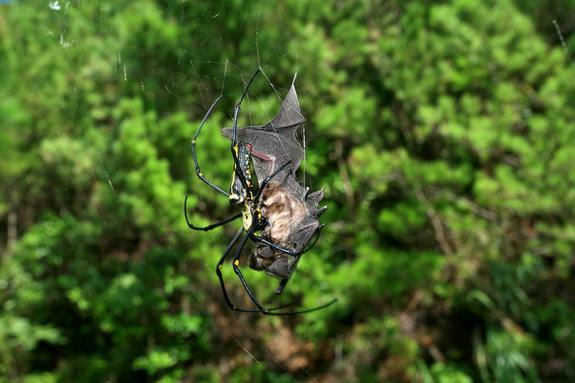 A female Nephila pilipes daintily dines on a dead bat (Rhinolophus cornutus orii) caught in its web in Japan. Spiders are a fascinating and remarkably successful group of arthropods, with 41,000+ living species and 500 or so new species being discovered and described each year. They are also a very old lineage, the earliest definite spider fossils date to some 300,000,000 years and indicate that the history of the group extends back even further than that. Spiders come in a wide range of sizes and shapes and exhibit a remarkable diversity of ecology and lifestyles. 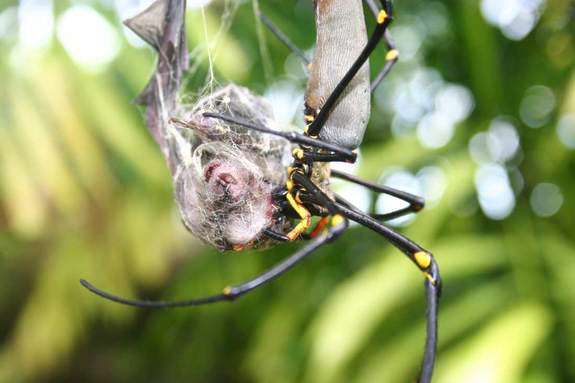 A small rhinolophoidean bat entangled in the web of Nephila pilipes in Australia. All spiders are predators and while they most feed on invertebrates, especially other arthropods, occasionally larger prey is taken. A recent paper by Martin Nyffeler and Mirjam Knornschild documents the little known fact that spiders sometimes also fed on bats. In most cases these are large spiders that produce large orb-webs that snare small, insectivorous bats that are actually smaller than the spider. While none of these spiders specializes in capturing and feeding exclusively on bats, this fascinating behavior has been observed on all continents (with the exception of Antarctica) and is not insignificant. Map showing reported incidents (red dots) of bat predation by spiders. Nor is it just bats that are caught in webs. There are a number of published records of small birds taken by spiders as well, although that appears to be much rarer than incidents with bats. 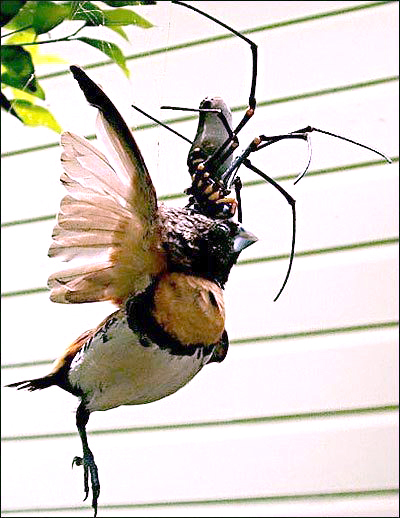 A Nephila feeds on a finch in Australia. In most cases the bat/bird predator is a large spider of the genus Nephila, the largest orb weaving spiders. Nephila is known as a golden orb weaver, a reference to the color of its spider silk. Its poison is a neurotoxin similar to that of the famous Black Widow Spider. While not lethal to humans, the amount of toxin injected by Nephila when biting a bat smaller than itself is relatively huge --- and fatal. Nephila jurassica, the largest fossil spider. Actual specimen on left, explanatory drawing on right. Because their exoskeleton is only weakly mineralized, spiders have a relatively poor fossil record. 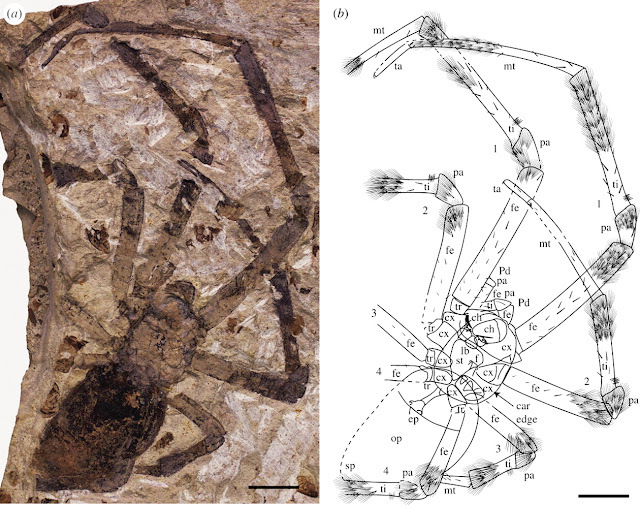 However, it turns out that the largest known fossil spider is also referable to Nephila. Nephila jurassica is known from a single specimen, a female, and comes from rocks of Middle Jurassic age of China, some 165,000,000 years-old. 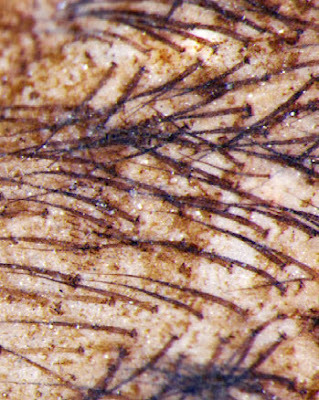 The fossil is reasonably complete and the preservation is spectacular, with even fine details of sensory “hairs” clearly visible. The remarkable preservation of N. jurassica is evidenced by these fine sensory hairs on the opisthosoma. 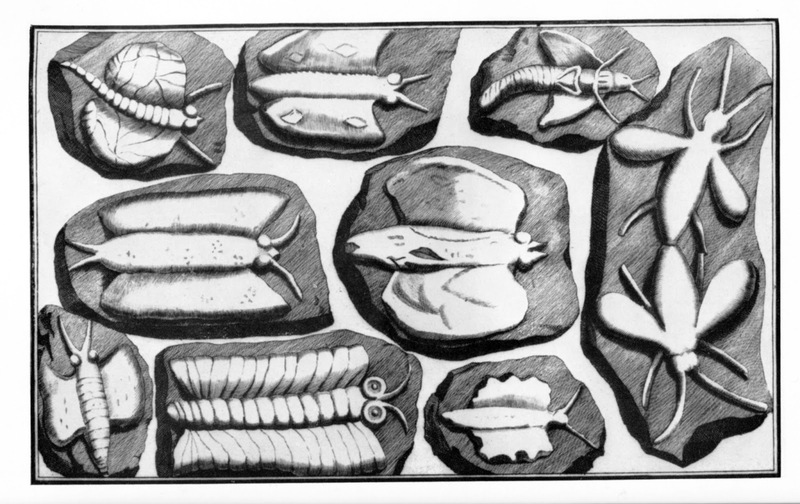 Insect fossils are very diverse and common in the rocks in which N. jurassica was found and certainly were the primary food source for the species. However, given the work of Nyffeler and Knornschild on modern spiders and bats, one might naturally wonder if birds and/or bats might have also fallen prey to N. jurassica. The oldest definite fossil bats, known from well preserved skeletons, date from the Eocene Period about 100,000,000 years younger than N. jurassica. The oldest known bird, Archaeopteryx, is from the Late Jurassic of Europe, about 15 million years younger than N. jurassica. Furthermore, Archaeopteryx is the size of a raven or crow and much too large to be caught in a spider web. However, there is another group of Mesozoic flying vertebrates that might have provided a feast, at least occasionally, for Nephila. The small pterosaur Anurognathus ammoni pursues an insect in a Late Jurassic forest in Europe. Pterosaurs first took to the skies in the Late Triassic and continued soaring and flapping until the end of the Cretaceous. During those 160,000,000 years they evolved into many different sizes and shapes, and flew in everything from forests to soaring great distances over open oceans. 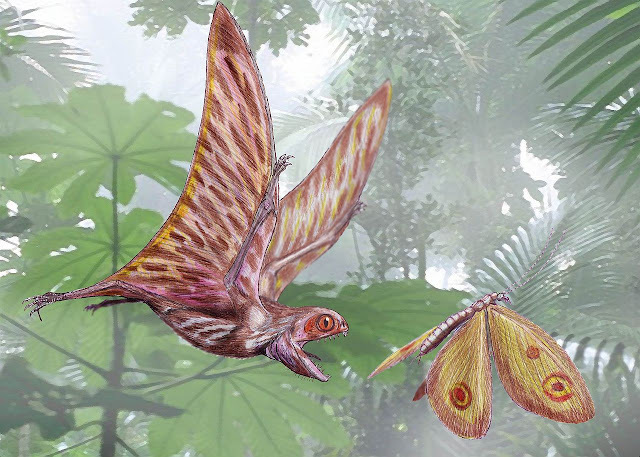 While some pterosaurs were gigantic, others were quite small. Anurognathus had a body length of just 4 inches and a weight of only 1.5 ounces. This is small enough be caught in a large web, such as that made by N. jurassica. The complete, but very small and delicate, skeleton of Anurognathus ammoni is more easily seen under UV light. Nephila. Proudly killing and eating flying vertebrates for 165,000,000 years. It would be a beautiful thing. Thanks to Tracy Ford for calling my attention to N. jurassica. of the strictly fossil spider families. 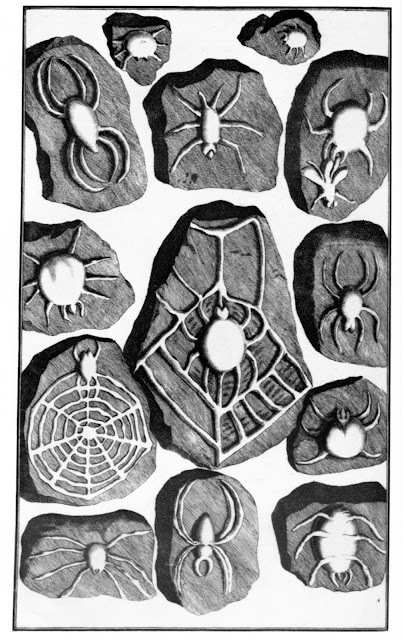 European Arachnology (Deltshev, C. and Stoev, P., eds). Acta zoologica bulgarica, Suppl. No. 1: pp. 25-39. Witton, M.P. 2008. A new approach to determining pterosaur body mass and its implications for pterosaur flight. Zitteliania B28: 143-159. Nephila pilipes with bats in Japan and Australia and map of incidents: Nyffeler and Knornschild 2013.